I have a Grandson by the name of Max. Max is an eight year old who is all boy. If there is a kid version of a Manly Man, then he is it. Frogs, bugs, the whole enchilada. Despite his blond hair and blue eyes, Max also happens to have some American Indian blood flowing through his veins. His paternal grandfather (who he is named after) was from the White Earth band of Ojibwe (Chippewa). Last fall our family spent a weekend on the north shore of Lake Superior. As is often the case when we go there, I gathered a few choice pieces of driftwood to fashion into canes in my spare time. The stack of these "would be" walking aids seems to keep growing in my garage, since the spare time seems scarce. Knowing my propensity for fashioning these sticks, Max picked one out and asked me to make a walking stick (rather than a cane) for him. He had very specific instructions. He wanted the larger diameter end to be the bottom. He also wanted a band of leather of a specific width in a specific place. Being the good grandfather that I am, I completely ignored his instructions. Actually, what I did was spend a little time searching the Internet for examples of ceremonial spears. That was the "flavor" I was looking to duplicate. The result was a walking stick that totally blew Max away. Far from being disappointed with my failure to build it to his specifications, Max was delighted. It was far and away better than his expectations. That is EXACTLY the reaction I was looking for. We live in a society in which most of us get to have the majority of things we want (within reason). I am quite sure that in most cases those "things" wind up being a disappointment practically as soon as the wrapping comes off. Our expectations usually far outshine the actuality. Perhaps that is why I took as much delight in giving the walking stick to Max as he did in receiving it. It exceeded all expectations. I couldn't help but think that this, in a small way, is a little like what God has in store for us. Of course the verse that comes to mind is 1 Corinthians 2:9 "But as it is written, Eye hath not seen, nor ear heard, neither have entered into the heart of man, the things which God hath prepared for them that love him." I don't want to be found guilty of taking a verse too far out of context, so I want to point out that the following verse states: "But God hath revealed them unto us by his Spirit: for the Spirit searcheth all things, yea, the deep things of God." Even so, I don't think I am overstating things to say that even if we do have a glimpse of the glory of the new heaven and new earth as described in the book of Revelation, it is still going to far exceed our expectations. I think it will totally blow us away, and I think that will be EXACTLY the reaction God is looking for! Before too much time slips away, I had better post my follow-up to The Venerable 4 Speed Clutch - Part 1 In that post I told of many of the most common problems with this clutch design which Harley used from 1941 until 1984. As promised, I would like to now give a few tips on making it work even better than when it was new. Some of these are aimed primarily at drag racing, but many are readily adaptable to street use. Starting at the back of the assembly, a 5 stud clutch hub is a worthwhile upgrade for performance use. Whether you upgrade your existing hub, or buy a new one may come down to a money issue. If you can change the studs yourself it may be cheaper to do that, but if you have to pay someone to change the studs, it may be just as cost effective to buy a new 5 stud unit. Replace the "clutch hub fiber disc" with the "Nylatron" unit. 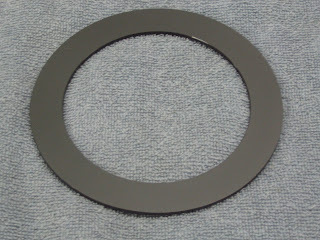 In normal use, this fiber disc works as another clutch plate. That means that it is susceptible to making the clutch drag if there is insufficient release between it and the back of the clutch basket. Since this plate is behind the clutch hub bearing, it is also inordinately susceptible to grease from that bearing, further enhancing the probability it will drag. Whether the Nylatron disc was designed this way or not, what I like to do is treat it like a bearing rather than a clutch plate. I grease up the Nylatron disc on both sides to make it unlikely to give any drag. An added bonus to the Nylatron is that it is "full floating", so you don't have to worry about riveting it in like the stock disc. Clutch plates. Besides making sure that the plates are in good shape (not oil soaked or glazed) the other consideration is what use the clutch will be put to. For even hard street use, I would still recommend cheap replacement fiber discs. I remember (from back in the old days) one particularly successful street class racer used a particular brand of cheap aftermarket fibers with great success. Due to having a high horsepower motor along with a street tire, he slipped his clutch while launching the bike, managing a near perfect blend of RPM and traction. Sort of like a slipper clutch, only with the rider's clutch hand providing the magic. After every pass, he would swap the clutch plates out, allowing the most recently run ones to cool. I wish I could remember what brand plates he said he ran, because he did say not all of them worked equally well. Working our way out, an aluminum pressure plate will almost always work better than the original stamped steel one. They don't flex. They are also surprisingly affordable. The clutch spring retainer is the steel disc at the outer end of the clutch that the 5 nuts (now that you upgraded from a 3 stud hub) tighten. It will have 5 "nubs" that the special nuts index on. You're going to want to grind those nubs off. Discard the special nuts and use nylock nuts in their place. Now you will be able to get a fine adjustment on the pressure plate rather than in 1/2 turn increments as the special nuts provide. Now if your bike is going to be used mostly on the street, and you have no clutch drag, you are all done. If, however, this clutch is going to see some major drag racing use, you might want to keep reading. Most clutch problems on the drag strip are related to dragging, not slipping. Even a clutch with perfect street manners will tend to drag when your bike is staged and at 4000 RPM or more. Remember, all the clutch needs to do is "pull" your bike an inch or two and you have red lighted. Besides, it is pretty much impossible to cut a good light when distracted by a dragging clutch. The solution (if you have addressed all of the items here and in the first post) is to add more release travel. As I mentioned in part 1, you can remove the hand grip to allow the clutch lever to move farther. A layer of electrical tape will make the bar a little less slippery without a grip. One last trick. You can also add a little more travel to the clutch release by shortening the release arm (the lever that comes off the top of the kicker cover). You should be able to take about an inch out of the center of this arm without adding too much misalignment to the cable. Remember, this will also make for a heavier lever pull. There you have it! All the tricks and tips that I know for the 4 speed clutch... well, at least all of them I remember. Will this solve all of your clutch problems on the street? I think so. On the strip? To a point. Even with a more modern clutch, I found that a 6000+ RPM launch required a line lock on the front brake to avoid being pulled through the lights. But for a 60 year old clutch design, I think you'd have to agree it was a good one. Over at the Recliner Commentaries, my Pastor has posted an article he wrote refuting the recent Newsweek article which attempted to make a "religious case for gay marriage." His post is well thought out and worth spending the time to read, however, this post has to do with the comment section from his refutation. It seems that a commenter by the name of Steve has some real issues with Christians opposing "gay marriage". In fact the long and short of his various comments come down to this. It is hypocritical for Christians to spend more time opposing "gay marriage" than they do in opposing the liberalization of divorce laws since both of these things weaken the institution of marriage. The exchanges in the comments section have been numerous and heated. I have a lot of thoughts and opinions on these subjects, but to narrow this post down to a manageable size I want to comment on only one aspect. To the cry of "Hypocrite! Hypocrite! ", I answer; Guilty! Guilty! You see, that is what real Christianity is all about. Being a hypocrite. Despite God's work of giving us a new spirit, redeeming us by his blood, and making us free from the penalty for our sins, we are still stuck with this flesh. And as long as we are stuck with this flesh we will continue to sin. Paul touches on this in Romans 7:18-24 where he says: "For I know that in me (that is, in my flesh,) dwelleth no good thing: for to will is present with me; but how to perform that which is good I find not. For the good that I would I do not: but the evil which I would not, that I do. Now if I do that I would not, it is no more I that do it, but sin that dwelleth in me. I find then a law, that, when I would do good, evil is present with me. For I delight in the law of God after the inward man: But I see another law in my members, warring against the law of my mind, and bringing me into captivity to the law of sin which is in my members. O wretched man that I am! who shall deliver me from the body of this death?" So, if your complaint is that Christians are hypocrites, then you are right indeed. But being a hypocrite does not relieve a Christian of his duty to proclaim God's word; all of it, even when it is not convenient. This is a Christian's duty, even when he will be called a hypocrite and unloving for doing it. Yes, a Christian is to proclaim God's word in as loving a manner as he can, but what could be more unloving than not proclaiming it at all. I, for one, am longing for the day when I no longer have this sinful flesh to deal with. What with all the computer problems and such, I have not posted much lately. That doesn't mean I have been on my couch relaxing though. I have actually made a bunch of progress on building a "period correct" Harley drag bike. I use the term period correct here with a little trepidation, because by some people's standards, that would mean little or no use of reproduction parts. I just plain can't afford to do that, either from a monetary or a safety standpoint. My plan is to build a bike that is as period correct for the mid 1950's without "breaking the bank". 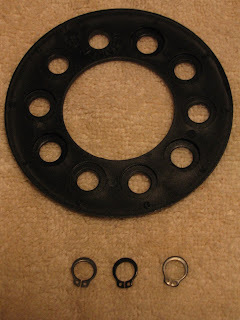 As I alluded to in an earlier post, I plan to build a Knuckle using a set of dual Linkert heads that I already have. The first thing I did after committing to building this bike was to order a set of new STD replica Knuckle crankcases. I know, I know.... I've already ruined it for some of you! Sorry, but there is just no way I can justify the cost of a set of original cases, not to mention the inherent weakness in an aluminum casting that has seen at least 60 years of abuse. I hope that you purists will find it in your heart to forgive me. Another major piece has been donated by my good friend Watso. 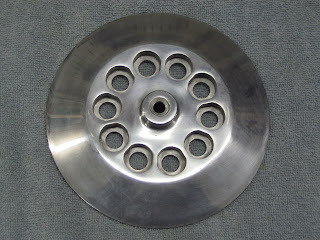 After reading my blog he called me to offer a replica Panhead frame. Needless to say, that is a major step forward in the project, and Watso's generosity makes the whole thing much more financially feasible for me. the complete vintage drag racing 2 speed transmission from Don Jone's 1950 drag bike, "The Gorilla". I will need to freshen it up, but it will be the real "centerpiece" of the bike. I have new Rowe exhaust valves and guides. On the intake side I have a set of Screamin' Eagle 2.080" valves (selected because of their shallow tulip and being the correct size for the existing "choke" in the heads). 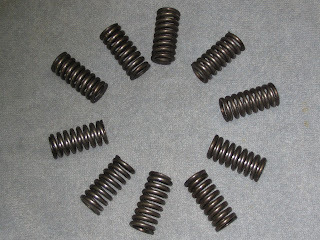 The 5/16" stem diameter of these valves necessitate fabrication of custom valve guides, for which I have already obtained the blanks from Rowe. I have also ordered a set of flywheels from Truett & Osborn . At this point in time, my plans are to buy a reproduction springer, which will help to give the bike that real vintage look. I will also likely buy a pair of reproduction star hubs, since it seems like you always have to take five used ones apart to find one good one. Rear fender will likely be a cut down reproduction. Cam? Leineweber without a doubt. The only question is whether it will be the #3 or the #5 grind. I plan to get a little further with the heads before making that decision. One thing I am still up in the air on, is what fuel tank I should use. I toyed with using a Hummer tank, but seeing what they bring on eBay may have ruled that out. Thoughts? By the way, this bike has found a nickname before it has even had its first two parts permanently bolted together. Vinnie.... short for vintage drag bike. It is interesting how much a little thing like your laptop being in for repairs can mess up a guy's routine. I carry mine back and forth to work, and use it there as well as at home to run/ship eBay stuff. Normally I spend my lunch break reading a few blogs that I follow, and doing a little writing for this blog. I usually manage to answer the occasional email during this time also. But not for the last week and a half! The laptop is in for major repairs, and not due back until the 8th. The silver lining is that I had purchased an extended warranty on it (something I would not normally do). I guess having the warranty put off the day when I switch over to a Mac. Microsoft has become something of a dirty word around our house, with the untold hours lost due to programs that don't work correctly. And then there are the viruses. Anyway, that is why I haven't posted for a while. Hopefully that will change soon.